The Model 18 continuously monitors 3-phase power lines for abnormal conditions. 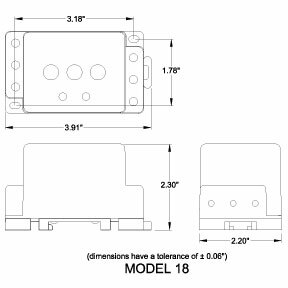 When properly adjusted, the Model 18 monitor will detect phase loss on a loaded motor even when regenerated voltage is present. 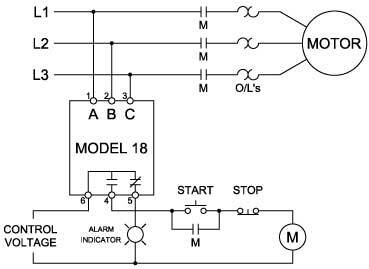 This device consists of a microcontroller with a voltage and phase-angle sensing circuit, driving an electromechanical relay. When correct voltage and phase rotation are applied, the internal relay will energize. A fault condition will de-energize the relay. When the fault is corrected, the monitor will automatically reset. 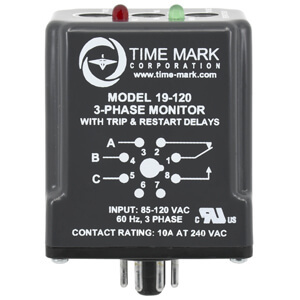 An adjustable restart delay prevents short cycling in compressor applications and an adjustable trip delay prevents nuisance tripping during power fluctuations. The Model 18 does not require a neutral connection and can be used with Wye or Delta systems. Voltage ranges are sufficiently wide to allow for proper adjustment to existing conditions. Both FAULT and NORM condition indicators are provided to aid in adjustment and system trouble-shooting. 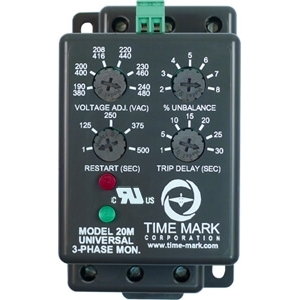 The Model 20 is a microcontroller-based universal 3-phase monitor for protecting 3-phase motors from abnormal power conditions. It can detect under voltage, over voltage, voltage unbalance, reverse phase, and single-phasing even when regenerated voltage is present. 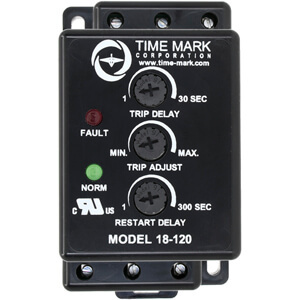 The Model 20 includes adjustable trip and restart delays to prevent nuisance tripping during power fluctuations and short cycling in compressor applications. The LED status indicators and adjustment pots for Voltage Adjustment, % Unbalance, Restart Delay and Trip Delay are mounted on the front of the unit for easy access. Automatic or manual restart versions are available. The Model 20 does not require a neutral connection and can be used on either Wye or Delta systems. All versions of the Model 20 are UL Recognized (U.S. and Canada) and are available with optional gold flashed silver contacts for low current applications. The Model 20AA is a microcontroller-based universal 3-phase monitor for protecting 3-phase motors from abnormal power conditions. It can detect under voltage, over voltage, voltage unbalance, reverse phase, and single-phasing even when regenerated voltage is present. The Model 20AA includes adjustable trip and restart delays to prevent nuisance tripping during power fluctuations and short cycling in compressor applications. 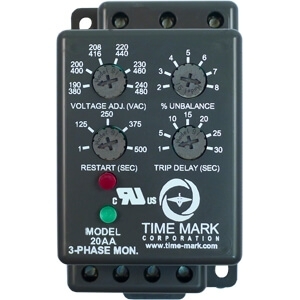 The LED status indicators and adjustment pots for Voltage Adjustment, % Unbalance, Restart Delay and Trip Delay are mounted on the front of the unit for easy access. The 20AA has 2 normally open (N.O.) isolated contacts. Automatic or manual restart versions are available. The Model 20AA does not require a neutral connection and can be used on either Wye or Delta systems. All versions of the Model 20AA are UL Recognized (U.S. and Canada) and are available with optional gold flashed silver contacts for low current applications. The Model 19 continuously monitors 3-phase power lines for abnormal conditions. When properly adjusted, the Model 19 monitor will detect phase loss on a loaded motor even when regenerated voltage is present. The Model 19 does not require a neutral connection and can be used with Wye or Delta systems. Voltage ranges are sufficiently wide to allow for proper adjustment to existing conditions. Both FAULT and NORM condition indicators are provided to aid in adjustment and system trouble-shooting.